You live in a world of awesome progress, but paradoxically of appalling evils. WHY? It's a world held captive, loving its captivity. THE NEWS has been replete with stories of kidnappings and aircraft hijackings. Bizarre among them was the Patty Hearst kidnapping, in which the victim was brainwashed into preferring the criminal life of the kidnappers to the respectable status of her parents. Happily, Patty's mind later became cleared of the delusion. But most astonishing of all is the actual fact of the colossal kidnapping of all time — in which the captive for 6,000 years has willed to pursue the life and evil philosophy of the archkidnapper Satan the devil. The willing victim in this case is the world that inhabits this planet earth! Yet this world has been so completely deceived that it cannot realize what actually has happened to it. In this 20th century a world of awesome progress and material development is so blinded by the deceptions of the superkidnapper that it cannot understand the paradoxical fact that its progress is accompanied with appalling and still escalating evils inflicting indescribable suffering, frustration and death. In a famous law school a professor of law devoted 30 minutes of a speech explaining that lawmaking bodies, judges and supreme courts are unable to determine right from wrong on many knotty problems before the courts. WHY? You live in a world almost 6,000 years along on its course of history. You see the world as it is today at this advanced stage of civilization, with its systems of organized society. I have learned, in a lifetime now in its 92nd year, that errors all too frequently arise from a false premise, carelessly assumed. The eyeglasses through which all modern thought is viewed is this theory of evolution. To my satisfaction, after in-depth study and research, the theory has been proven false. If you prefer to believe this illusion because it is presently the educational "IN" thing, you can have no rational understanding or explanation of the conditions of the world in which you live. I have learned that basic original truth is revealed truth. Without it you are left devoid of the knowledge of reality. Evolution cannot explain the problems and frightening state of humanity. You cannot understand any purpose for human life. Your very existence is without meaning. The Word and God LIVED. What did they do? They created. How did they live — what was their "life style"? They lived the way of their perfect character — the way of out-flowing LOVE. When Christ was baptized, God the Father said, "You are my beLOVED Son." God LOVED the Word. And the Word LOVED God — obeyed him completely. God creates in dual stages. Angel life was not completed until CHARACTER had been formed within them. Character may be defined as the ability of a conscious thinking entity to choose the way of life of outflowing LOVE — God's law — and to will to live that way of life, even under outside contrary pressure or contrary self-desire. Once CHARACTER had been formed and lived, angels, composed of spirit, could never change. I compare it to the pouring of cement or concrete. When first poured its form and shape changes — but once "set," it is hardened and cannot be reshaped or formed. Following the initial creation of angels, God created the physical UNIVERSE. Chapters one and two of Genesis state that the earth and the heavens — the physical universe with galaxies — were all created in the same day. In this instance "day" does not necessarily mean a 24-hour day, but a general period of time. 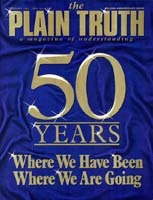 Job 38 says plainly the earth was created when angels had been previously created. God placed a throne of GOVERNMENT on the earth. Both Isaiah 14 and Ezekiel 28 reveal the cherub Lucifer being placed on the throne of the earth. II Peter 2:4 reveals that angels SINNED. Lucifer was a super archangel. Lucifer had been trained in the administration of God's government on the very throne of God in heaven. He was supremely beautiful, dazzling in brightness. Vanity seized him. Vanity is self-glory, self-centeredness, concern for self even to the point of hostility toward others. He became jealous, envious, resentful and hostile against God his Creator. He turned hostile to the law of God. He turned to a way of life of vanity, covetousness, envy, rivalry, competition, violence and destruction. And this hostile way of life is itself a LAW. It is the law of vanity, self-concern, "do your own thing," rebel against the authority of God. That, then, became the basic LAW of the GOVERNMENT of Lucifer, whose name was changed to Satan the devil. The name Satan means "adversary." So the government of God on the earth had been replaced by the government of Satan. This sin of the angels, now called demons, brought on them the PENALTY of perversion of mind, bitterness, anger, wrath — but they had been created immortal. Their character now "set" as evil, being spirit beings, they can never change. Forever they must suffer the torture of such perverted and unhappy minds. Their sin brought physical chaos, decay, ruin and darkness to the physical earth. In Genesis 1:1 God (Hebrew: Elohim — "Gods," meaning God and the Word) is revealed as the Creator of the universe, including the earth. The earth was — BECAME (resulting from angelic sin) — tohu and bohu, Hebrew words meaning "chaotic and in physical confusion, waste and empty." Under Satan, darkness replaced light. Later the Word spoke, "Let there be light," and physical light appeared on earth, dividing day from the darkness of night. In six 24-hour days God renewed the face of the earth for men, creating plant, fowl, fish and mammalian life. On the sixth day, God said, "Let us [God is speaking to the Word] make man in our image, after our likeness" (Gen. 1:26). The Eternal (who became Jesus Christ some 4,000 years later) formed man of the dust of the ground (Gen. 2:7), and upon breath of life entering, man became a living (not immortal) soul. The very first chapter in all the Bible reveals it, if we have the wit to comprehend. God — that is, God and the Word — created MAN in God's own image, form and shape. The word image is used in Hebrews chapter one to designate spiritual CHARACTER. It is only by revealed knowledge that this tremendous difference can be known. And the written Word of God reveals it as the presence of human spirit within man that sparks, constrains and empowers the physical brain in humans with intellect. There is no such spirit within any other form of physical life. As explained in the beginning, God and the Word now form the GOD FAMILY. Man may be begotten, and then later born as divine GOD. It is the incredible human potential that each human may become a child of God, one of the very GOD FAMILY! The first law of science is the fact that only life can beget life. Life cannot come from the not-living. LIFE could not have gradually come into existence from nothing. God could not have gradually come into existence. God and the Word ALWAYS have coexisted — without father, without mother, having neither beginning of days nor end of life — but living from eternity through eternity. Out of matter God created the fauna and the flora — animal and vegetable life. We might classify all existence in kingdoms. The mineral kingdom, the plant kingdom, animal kingdom, human kingdom, angel kingdom and the GOD KINGDOM. Man was created in the human kingdom, and potentially may be born into the GOD KINGDOM. But religionists who boast of being already "born-again Christians" are sadly deceived. The ultimate creation of man — to become GOD — necessitated the development of godly CHARACTER within him. So at this point notice the system of duality in this ultimate GOD creation. Physically, man was made complete in two stages; first male, then the addition of female. Spiritually and mentally he was to be made complete in two stages; first a human mind empowered by a human spirit. Even as God had supreme MIND, man was made with human mind. But in mind and spirit man was not yet complete. To complete his physical creation, once the female was added to the male, they became ONE as a human family. So, in the spiritual creation, the addition of the HOLY SPIRIT of God must be added to the human spirit. This makes the man spiritually AT ONE with God. But even at this stage the principle of duality is still in force. Once the Holy Spirit is joined with his human spirit his human mind is complete, but he is still a human, now begotten as a God person. He is only an HEIR of God, not an INHERITOR of the God kingdom. He is only begotten, not yet born as God. The duality principle continues. Human birth is the precise type of GOD birth. In the woman is an egg cell called an ovum. It possesses potential life. Yet unless fertilized by the human sperm cell from the body of the father, it has a life span of less than 28 days. The male sperm cell on entering it endows it with the start of human life. But to call it already a BORN human compares to the deceived calling themselves "born-again Christians." On conception the ovum is called an embryo. It must grow physically, fed through the mother. By four months, when taking on human form, it is called a fetus. It continues through a period of gestation for nine months from conception to parturition, when it is born. The first human, Adam, was created, as we might say by analogy, a spiritual ovum. He had only a temporary physicochemical existence. If "fertilized" by the male divine sperm of God (his Holy Spirit — actually God-LIFE), he would have been begotten, but not yet born as God. But God is supreme perfect spiritual CHARACTER. Before Adam could even qualify to be begotten into the GOD family, he had to CHOOSE between the WAY of God and the WAY of Satan who still sat on the throne of the earth. God placed Adam and Eve after creation in the beautiful garden of Eden. In its midst were two special symbolic trees of tremendous significance. Adam did not have immortal God-life, but God freely offered it to him through the tree of LIFE. Adam had to choose between the government of Satan with its self-centered way of life, and the government of GOD with its GOD-centered way of life. Each way of life was the basic LAW of a GOVERNMENT. God could have RESTORED the government of God on earth through Adam, had he chosen that WAY of ETERNAL LIFE. On creation, late on the sixth day we call Friday, God briefed Adam and Eve on the situation. He continued through the Sabbath eve and on that first Sabbath. He explained that the way of self-centeredness, symbolized by the tree of "the knowledge of good and evil," would reject God's gift of LIFE (immortal), and on taking the forbidden fruit they would surely DIE. After that Sabbath, when Adam neglected looking after his wife, Eve stole out alone away from her husband. She encountered Satan in the form of a serpent. The human family was a direct threat to Satan's continued rule on earth's throne. Notice, however (Gen. 3), Satan did not say to Eve, "Choose MY government and my law of vanity and self-centeredness, and reject God." He merely tempted her with the BEAUTY of the forbidden tree, appealed to her intellectual vanity, suggested God wasn't fair, and let her succumb to his deception, assuring her she was already an IMMORTAL SOUL. She was deceived into believing Satan, disbelieving God and into TAKING of the forbidden fruit. She gave also to her husband, and Adam willingly disobeyed God. Adam took TO HIMSELF the knowledge — that is, the production of knowledge — of what is good and what is evil. Thus the first created human disbelieved God, disobeyed God, chose to go HIS OWN WAY, do his own thing. Adam did it willingly, but not apparently willfully. Willingly, Adam was led into captivity by Satan. He had willingly gone along with Satan, the arch-kidnapper of all time. Adam had been created with the potential to be born a son of GOD. Even though not as yet even a begotten son of the God FAMILY, he had been created as potentially just that. Once he succumbed to Satan's WAY of choosing to "do his own thing," in rebellion against a deliberate command of God, he became spiritually the property of Satan. He actually had succumbed to the GOVERNMENT of Satan, choosing the LAW of that government, leading automatically into attitudes of self-glory, coveting, competition, desire to GET rather than God's way of GIVE. All humanity came out of Adam and Eve. The present world was FOUNDED in them. The WORLD has ever since been HELD CAPTIVE! The world had thus chosen THE WAY of the kidnapper, rather than of the potential Parent! But God the Father was to pay the ransom price and even yet bring his potential spiritual children back to him. Upon Adam's sin, God closed off the tree of life, until the second Adam, Jesus Christ, should pay the ransom price. There cannot be a law without a penalty. The penalty of human sin is DEATH. At this very foundation of the world, it was determined that Jesus Christ, as the "Lamb of God, should be slain in payment of the penalty for all human sin, effective upon repentance and faith (Rev. 13:8). It was also determined by God at that time that all Adam's children should die (Heb. 9:27), but as in Adam all must die, so in Christ the same ALL shall be made alive by a resurrection from the dead to be judged (I Cor. 15:22). But still, none could ever be born of God until God's holy and perfect spiritual character had been instilled within, by individual choice, and proof by performance. God set apart a 7,000-year period to complete his original SUPREME PURPOSE of reproducing himself through man. It was a masterminded MASTER PLAN for working out the PURPOSE here below. For almost 6,000 years a civilization has developed, which we call the world. But it has been a world held captive. To this day Satan is still on that throne. Meanwhile Satan has worked IN all humans. He has injected into the world enormous EVILS. Jesus the second Adam came to start an entire new WORLD OF GOD through the Church.